The Croagh Patrick Heritage Trail is a 60 kilometre walk from Balla to Murrisk, in County Mayo. We did it with a large group of people as part of the Croagh Patrick Heritage Trail Walking Festival, in aid of Croi, the heart disease and stroke charity. We've found that nearly every Irish trail can be done bidirectionally, and it doesn't typically make a lot of difference. The Croagh Patrick Heritage Trail was the first one we've done that you pretty much have to do from east to west, since the finish is at the foot of Croagh Patrick. It's a high quality trail, around two-fifths of which is off-road, and extremely rich in heritage. We found that it was reasonably low-difficulty, and the difficulty that there was was mainly due to the weather. I would highly recommend doing it as a guided walk (or with a guidebook), since it'd be pretty easy to miss a lot of the heritage in the region. Doing the trail as part of a walking festival was a really great idea, and I would like to say a huge thank you to everyone from the walking festival for being so accommodating to us! Doing the walking festival cost â‚¬50 per person for the full three days, and that money went directly to Croi. Also, we're walking again! Ellie's foot has healed up well so we're back doing Tough Soles full-time! I'm so excited. A few weeks before we were planning on getting back walking, we noticed a post by Walk and Hike Ireland about the walking festival. The festival was planned for March 9 to March 11, and we had initially planned to start back walking on March 1. The timing seemed to come together well, especially since we weren't planning on going particulary hard-core for the first month or so. The first few weeks coming back after an injury can be really dangerous. Plus, it's super cold. We got in touch with the festival committee and asked if it would be OK for us to film and if they could help us find a place to camp for the three nights. They were extremely good about everything and managed to find us a place to stay - the Aghagower indoor handball alley. This was beyond perfect for us - free, warm, private, and extremely convenient as the second day of the trail ends in Aghagower. And also, it had a working kettle and a working shower, making it better than some of the B&Bs we've stayed in over the years. (I want to say a huge thanks to Michael for allowing us to stay there). Since they were so accommodating and the stars had aligned so well, we decided we pretty much had to do the trail. We were all set to finish up our jobs, get out of the room we had rented in Dublin, and head down to Tipperary for a few days and then head to Mayo for our first trail of 2018. And then there was snow. If you were in Ireland for the start of March 2018, you'll know about the snow. Almost as much of a big deal as the 1964 Big Snow, the Beast from the East stopped the whole country in its tracks for a few days. Of course it managed to strike exactly when we were leaving Dublin, so we ended up staying in our apartment for an extra few days as we waited for the weather to calm down. It also meant both of us had extremely lackluster last days at work. We finally made it down to Tipperary and were a bit concerned all week that the festival would be cancelled - probably the second we made it to Mayo. Regardless, we packed light (for us, that means we left our cooking gear at home) and took the train up to Westport and stayed the night with some of Ellie's relations. They were lovely - thanks Nollaig and Gerry! Our hosts offered to drive us to the start point in Balla, which we greatly appreciated. We arrived in to Balla a little bit late and missed a few minutes of the opening speech by Sister Maureen, who really started the trail a few years ago. There were around fifty people in the community hall - none of them had even remotely as much stuff as we did, but then, none of them were camping or filming. Still, I felt a little self-conscious about our enormous 50+ litre bags when looking at other people's 6 litre day bags! The walk began with a short talk about the town of Balla by local historian Brian, and then we were off - to the sound of a piper marching us along! I'm thinking of hiring an piper for every trail just to give a feeling of enormity to whatever we happen to be doing. It genuinely was brilliant to do the first hundred metres led by a piper, and it was nearly worth doing the trail as part of a walking festival for that alone. The first day was generally very nice walking, with I think the least road of the three days. It was the shortest day of the three, I think maybe only around 16km. The day ended at Ballintober abbey, founded in 1216. I was reminded strongly of Boyle Abbey - it had somewhat similar construction and layout, and they were constructed within two years of one another. Sean na Sagart, an actual for-real these-actually-existed _priest hunter_ is supposedly buried here - have a read of a story from 1935 about Sean na Sagart here https://www.duchas.ie/en/cbes/4427866/4351988/4435439?ChapterID=4427866. We got a lift to Aughagower (thanks again, Cathal!) and were shown around and given keys to the local handball alley (thanks, Michael!). It was perfect. Warm? Check. Kettle? Check. Shower? Check. What more could you possibly need? We spent the evening in the local pub. Some of the country pubs we go into tend to have a weird attitude towards strangers wearing hiking boots, but I have to say, Scott's Bar was brilliant. We felt instantly comfortable. We cheered on as the owner's son had a boxing match live-streamed onto the pub, and went back to our sleeping bags happy. We slept poorly that night, for some reason (it was the pints), and were a bit disheartened to see grey skies and rain. I was hopeful that it would clear up during the day, but unfortunately no such luck. A bus was waiting for us in town. The general idea with this walking festival was that you would drive yourself to the day's end point in the morning, and you'd take a bus to the day's start point with all the other walkers. We don't drive, so we were lucky to be able to stay in Aughagower, since it was the end point for the second day. This meant that we got to leave our bags behind in the alley! Anyway, we had a nice sleepy bus journey back to Ballintober, where the day began. On each day of the trail, the start point had free tea and coffee for walkers, which in my eyes is basically a miracle. We had a few words from Brian about Ballintober Abbey, and off we went. We stopped multiple times each day for water and food breaks. Some of the organizers drove large water-cooler sized bottles of water and boxes of fruit to various points on the trail, and typically while we were eating and drinking, Brian would speak about the heritage of that particular area. This was really brilliant - I think every trail would benefit from more integration with local heritage. The walking would have been extremely nice bog and forest walking, except for the endless rain. Most of the day was spent with wet feet, even though we were both wearing waterproof boots - you simply sank up to your calf. Even so, I don't want to disparage the bog walking too much, because I have a feeling that leads to trails being turned into tarmac. We took some time to visit the Boheh stone just before lunchtime. As Brian told us, the Boheh Stone is situated at a point where you can see the sun "rolling" down the slope of Croagh Patrick, twice a year - April 21 and August 9, spring and harvest. This is thought to be an explanation for the neolithic rock carvings (cups and spirals) on the rock. Of course, we could barely see the trail in front of us because of the rain, but I definitely found it fascinating. We walked past Sean, a farmer, who gave us a great sheepdog demonstration ("Will you lie DOWN! "), and told us about his beehives, ducks, and guinea fowl. It was a lovely experience. The day ended with even more wet forest walking. The group ended up getting quite stretched, since some people (ourselves included) had a bit of a harder time making it through the mire. It doesn't help that when you're at the back of the pack, everybody else has already stamped down all the dry ground! Finally, we made it over a hill overlooking Aughagower (from which there is probably an incredible view of Croagh Patrick) and rolled our way down into the pub. The second day was the longest of the route, probably about 24km, which feels an awful lot longer when you're soaked after the first kilometre. Aughagower has a lot of heritage - four graveyards, one round tower, at least one church, and two holy wells (one of which Patrick himself baptised the local population in, according to legend). One of the wells, called St. Patrick's Vat, is also host to a Sheela-na-gig. Sheela-na-gigs are thought to be old pre-Christian symbols of fertility (they depict a woman in a bit of an exposed position), and you can often find them near holy sites. This one in particular is notable as it's been said that St. Patrick had a wife named Sheila. The weather on the last day of the trail had cleared up quite a lot, which was a relief. Most of the day was road until the last three or four kilometres, which my soggy feet were OK with. 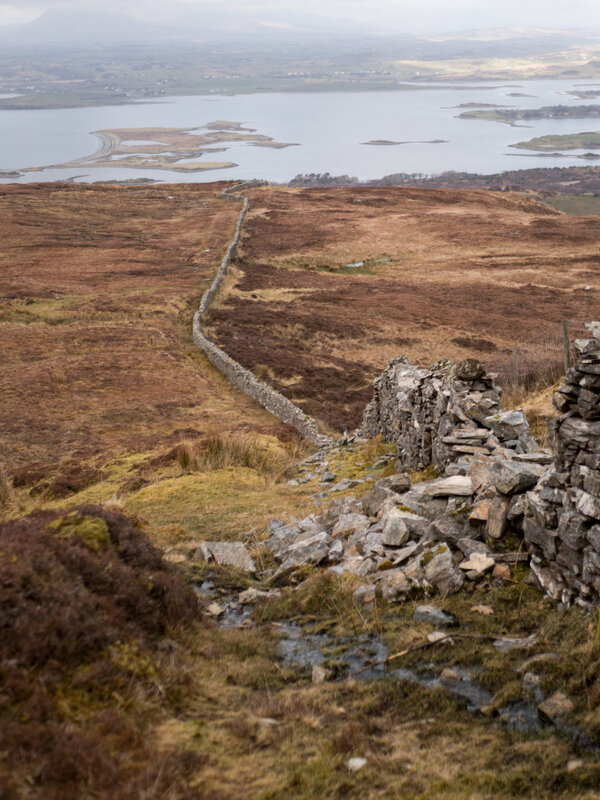 We began to get some incredible views across Clew Bay as the sky grew clearer and clearer. Our lunch this time was in Prospect school, and it was the best lunch of them all! I really can't say enough thanks to all of the volunteers who spent their time cooking for fifty or sixty hungry walkers. The last section of this walk is the best in my opinion - three or four kilometres across open mountainside. The trail doesn't officially go up Croagh Patrick, but it ends at its base, and so the final section is across the "shoulder" of the mountain. It was quite muddy, and a bit hard to follow the waymarkers (some of them pointed straight into rivers), but in general it was really enjoyable walking. It helped that the weather had fully cleared and we had an incredible view of the mountain on our left and Clew Bay on our right. The trail ends about 20meters from a pub, so it was the natural end point for many of the group, ourselves included. A really great way to finish a great trail. We look forward to doing the walking festival again in future years - hopefully we'll see you there. The Croagh Patrick Heritage Trail video is also out!